Maybe a new pair of pillows for the sofa or a different painting on the wall. from feeling one way and makes it feel another. 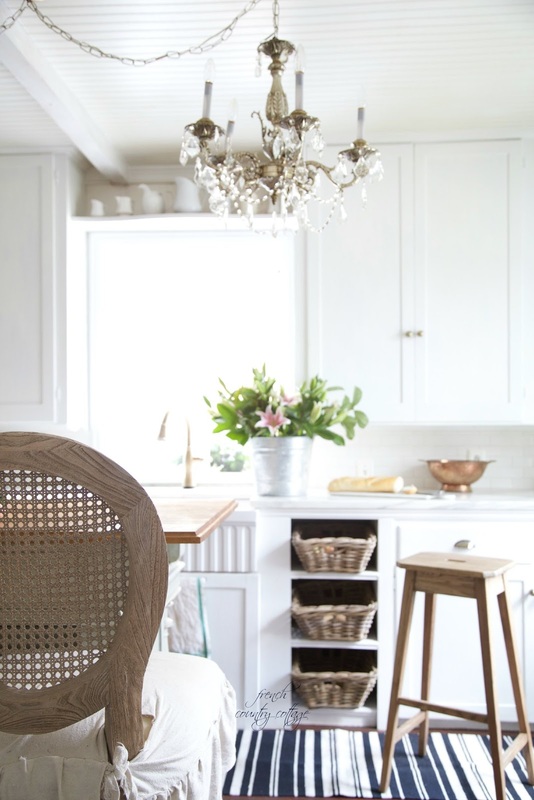 The other day I shared a peek on instagram of a styling I was working on in the kitchen. A lot of readers loved it but there were some didn't like it at all. I expect the feedback will be much the same here. And that is totally okay. I wasn't even sure that I 100% liked it when I shared. I was working on photographing. I simply needed something a little colorful for a backdrop for the photos. that one different thing in my kitchen surprised me. I actually said 'Wow' out loud. The kitchen felt completely different. 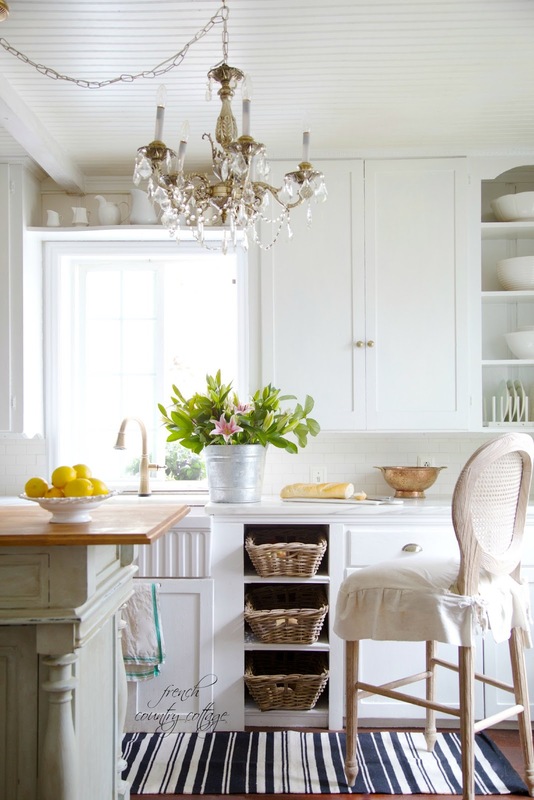 Our kitchen is pretty classic and elegant and serene in styling. It truly is my feel good, makes me happy, everyday love style. but it had a little bit different energy. I definitely enjoyed playing with that energy a bit while I snapped some photos. So what was that one thing? It was just simply a charming black and white striped runner. and I bring it in and mix it with everything else. rather than what is expected that makes the room. But I definitely do add color just not in a big way usually. big red and white oversized check. it would be that chalkboard behind the crystal chandeliers. for my quiet serene kitchen- it was fun and I had fun playing with it. And I loved seeing the difference that just that one thing made. your room and style absolutely memorable. can be pretty darn amazing. 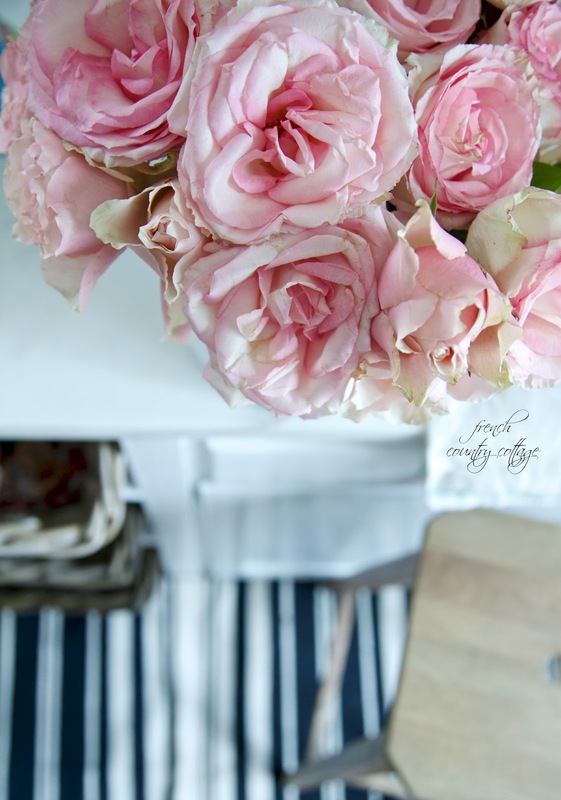 I love this post, Courtney...the sense of the unexpected is what makes a room interesting and personal to me! Thank you!! I totally agree Linda! This is a great post! We, being the people that live in our homes, should have what we want...what makes us happy...even if it is unexpected for others. Thanks for sharing. I actually love the rug, it looks like it belongs to me. 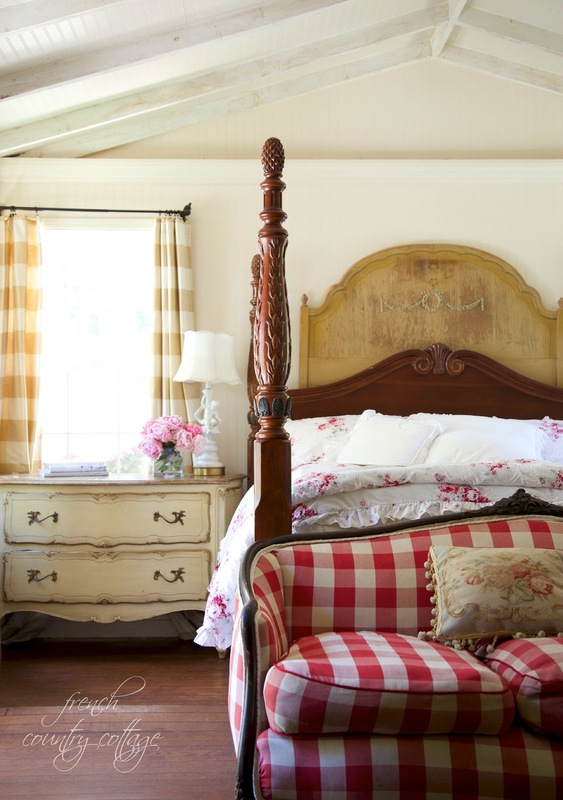 Sort of that vintage farmhouse elegant look. I think it does have a fresh farmhouse vibe too Marty. It was fun to play with it for a bit and see how it changed the look. Thank you for stopping by! I really like the rug in there, but it's your house and if you love it, that's all that matters. I believe that everyone should decorate for themselves and for what they love, or it isn't a true reflection of the person living there. Exactly how I feel. I am a bare wood floor kind of girl most of the time. Thanks for stopping by Mari! Oh Happy Monday to you! I love that I actually had a moment to spend here. Beautiful in every way. Thank you for stopping by Rhonda! I love your style and the rug looks awesome. The red check sofa reminds me of one I had 12-15 years ago but it wasn't French! it was in my family room and I loved it for a while! Keep up the great inspiration! I love your decorating style! Thank you Mary! The red check sofa is a favorite of mine for sure!! Hi Kathy, I didn't have a runner there- just the hardwood which is how it is everyday in the kitchen. 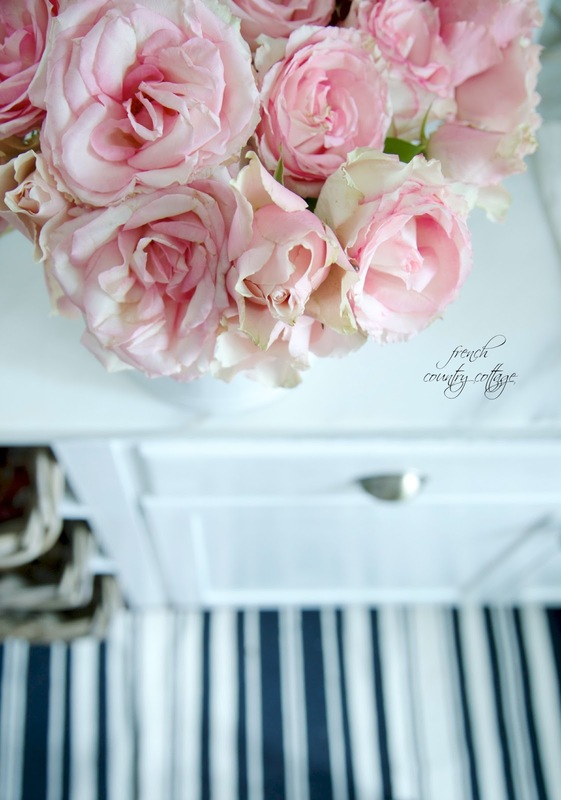 I do love black and white together- and with pale pink or pale blue- even better!! Thank you for stopping by! I tried to think what I would feel about the rug if you had not mentioned it and I just looked at the photo. 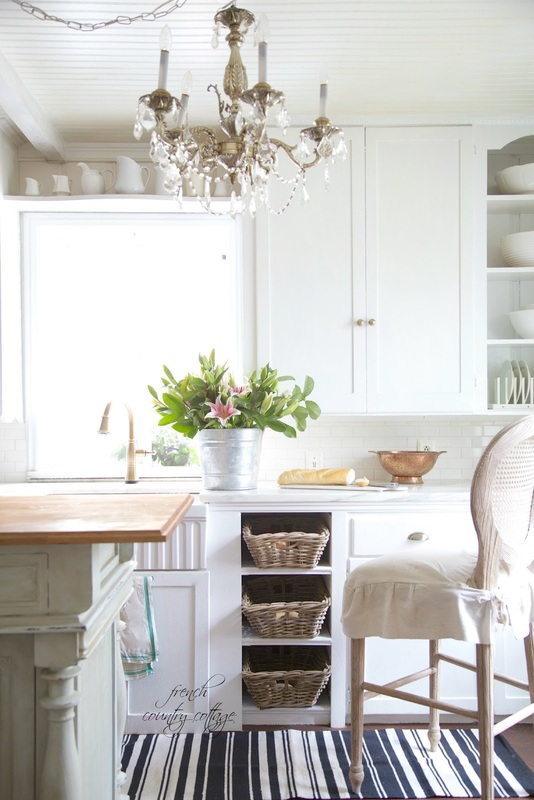 I LOVE what you have done in your cottage kitchen renovations. Always go with what you love, because that is perfect for YOU. That is the important thing. But, I like subtle and soft, so the boldness of the rug, distracts me from the harmony of the other elements. But, just goes to show how each "ingredient" in a room matters. LOVE IT! Love that idea. Enjoy playing with some of those treasures!! Thank you for stopping by! "One day, one item, a different dynamic". I LOVE this message! Wow is right! 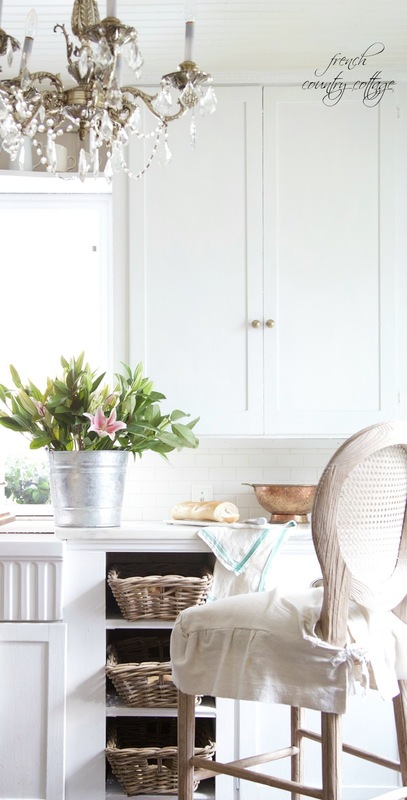 It's the stripes... What a pop of color, plus the repeat of stripes from the rug with the new fluted sink, and the baskets with their horizontal "stripes." Really looks nice! Love the stripes! In clothing and decoration... And your rug is so pretty Courtney! Love your home! Where is your barstool and seat cover from? Your whole jouse is lovely! Love the rug. I once read a quote by the quite famous designer, Charles Faudree. "It isn't so much the match as it is the mix." I think he is exactly correct. Your kitchen is just beautiful and I am sure you love and enjoy it every day. I love it! Your house is beautiful and I like your surprise pieces. The tug looks great in your kitchen! I like the rug, but I don't think it's "quirky" enough! 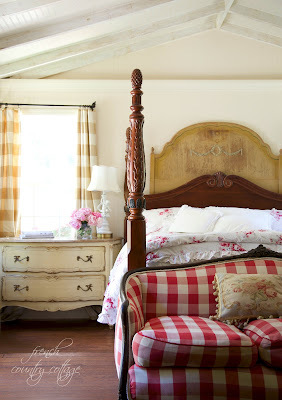 Your blackboard in dining room and buffalo checks in bedroom: perfect quirkies. I think you should really let go like you did in these rooms . . .